Jim Burt came to the University of Maimi from Orchard Park, New York, where he had an outstanding high school footbal career. 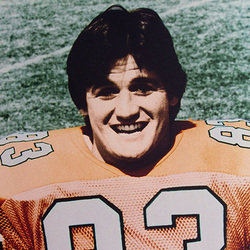 Jim was a force on the Hurricane defensive line throughout his career and was named the 1981 Peach Bowl Most Valuable Player (Defense). Burt held the U.M. all-time record for total tackles by a middle guard at 177 and assists by a middle guard with 86. He holds the school record for fumbles recovered in a single game with four vs Vanderbilt on November 15, 1980. Jim was selected as a member of the All-South Independent team by the Associated Press. Jim signed as a free agent with the New York Giants where we won a Super Bowl ring and later played for the San Francisco 49er's where he won another Super Bowl ring.